Mozilla launched a new Test Pilot project for Firefox today called Advance that provides article recommendations based on your browsing. The new experiment is a cooperation between Mozilla and Laserlike. Laserlike is a startup that built a recommendation platform and the experiment taps into the data to provide recommendations. A new sidebar with content opens after installation of the experiment. Whenever you open a new page in any tab, recommended content based on the page is shown in the sidebar. The recommendations should get better over time but are not closely related most of the time. 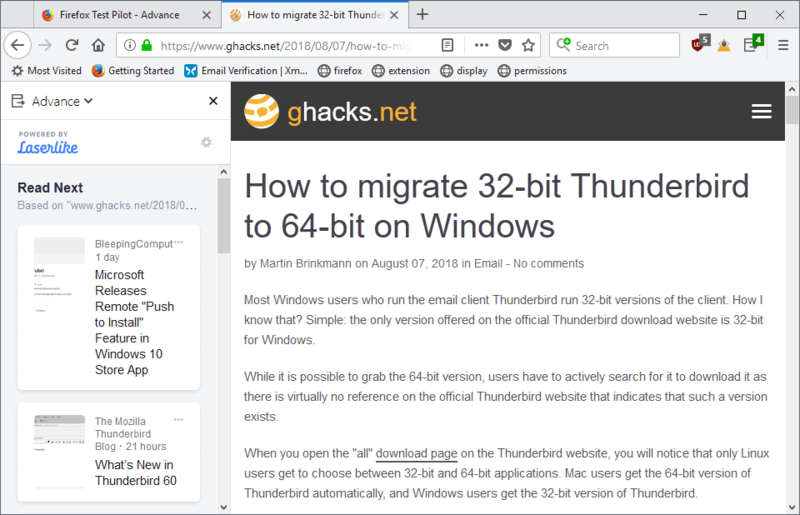 The Thunderbird article that you see on the screenshot above had a link to the official Thunderbird blog which was dead on, but three other recommendations that had nothing to do with Thunderbird. Advance, the name of the experiment, displays a “for you” section after a while that is based on your browsing. These stories are recommendations that may or may not match suggested content based on the page that is active in the browser. It is probable that recommendations get better the more you browse the Internet but the experiment is too fresh to verify that. Advance displayed recommendations from the “usual” assortment of recommended sites such as The Verge, Ars Techica, or ZDnet for the most part. If you want recommendations that are not mainstream you may be out of luck for the most part. One strong factor in suggesting content seems to be time-based. Opening old articles, e.g. 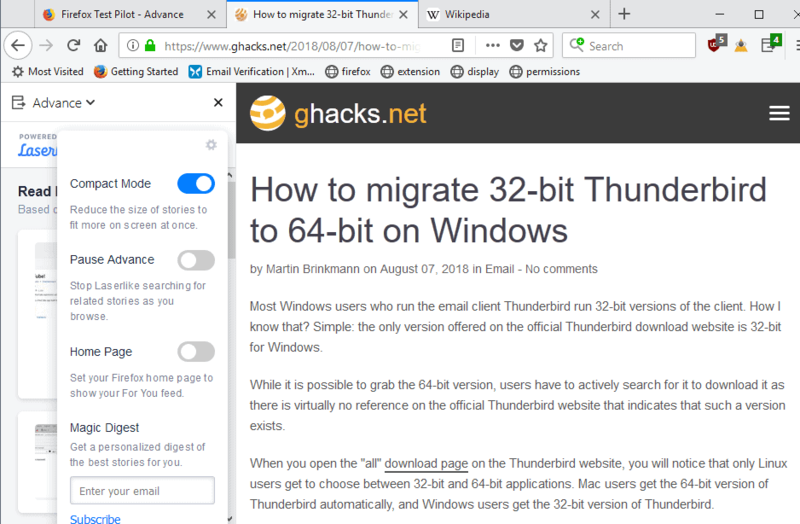 this Firefox 55 release overview one here on Ghacks, displayed pretty much the same suggestions displayed for the Thunderbird article, and all of them were published in the past 24 hour period. You can click on the Advance icon in the main toolbar to show and hide the sidebar, and also use the Alt-key > View > Sidebar listing to show and hide sidebars using it. A click on the settings icon in the sidebar displays several interaction. You can switch from the default compact mode layout one that shows bigger thumbnails, pause the experiment, set the Firefox homepage to show recommendations based on the browsing, and provide Laserlike with an email address to get a digest of stories sent to it. 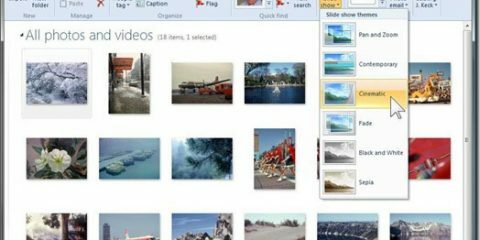 A click on account settings displays options to download a copy of the browsing history and of other data from Laserlike, to sign in to an account, and to permanently delete the browsing history and other data stored by Laserlike related to you. 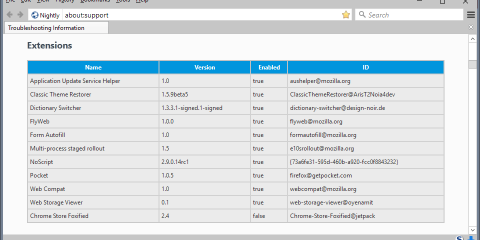 Test Pilot projects are designed to gather data about features that might one day land in Firefox natively or be offered as standalone applications. All Test Pilot project collect a set of data and individual projects may collect more data. Browsing history is sent to Laserlike. Data won’t be sent when in private browsing mode, when the experiment expires, when you pause it, or uninstall it. Laserlike receives the IP address, dates and timestamps, and time spent on webpages as well. Click-through rates, time spent on recommended content, interaction data with sidebar content and the experiment in general, and technical data about the operating system, browser, and locale is shared with Mozilla and Laserlike. Recommendations based on the browsing of users seems to be the next big thing. Google experiments with it and Mozilla has its hands not only on the Laserlike experiment but also access to Pocket which is already integrated in Firefox. I have no idea why Mozilla decided to cooperate with Laserlike instead of building something using Pocket as it feels like the natural choice. If you ask me, I have to admit that I’m not a huge fan of recommendation services even if you take privacy concerns aside. The recommendation engines seem to play it safe all the time by focusing on a handful of publications that you find referenced everywhere. I don’t need this; it would be different if the recommendations would be spot on but they are not for the most part. I would love to find a recommendation service that would help me discover new publications that I did not know about before; suggesting to read articles on ZDnet or The Verge is just not good enough in my opinion as I get links to those articles on social media sites and others already. You can read Mozilla’s blog post on the official Mozilla blog for additional information. Now You: What is your take on recommendation services? Ghacks needs you. You can find out how to support us here or support the site directly by becoming a Patreon. Thank you for being a Ghacks reader. The post Firefox experiment recommends articles based on your browsing appeared first on gHacks Technology News.